1. Cut the potatoes lengthways into 1cm slices, then cut the slices into 1cm chips. Rinse in cold water for 10 minutes then drain and pat dry with kitchen paper. 2. Heat the oil in a large saucepan or deep fryer to 130ºC, and cook the chips in 2 batches for 5 minutes each. Drain on kitchen paper then chill. They will keep like this for a few hours. 3. To make the mayonnaise, whisk the yolks, lemon juice, mustard and garlic with a dash of the oil in a food processor until pale. Gradually add the remaining oil in a constant thin stream with the motor running until you have a thickened mayonnaise. Season to taste. 4. Mix the barbecue sauce ingredients together and chill until required. 5. Heat the oil for deep frying to 190ºC and fry all the chips for 5-6 minutes until golden. Drain on kitchen paper, season and serve with the dips. 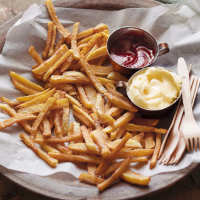 Cook’s tip: Try dusting the chips in sea salt, freshly ground black pepper and paprika. Eggs: recipes containing raw or semi-cooked eggs are not suitable for pregnant women, elderly people, or those with weak immune systems.